Subject: What Is the Electoral College? American democracy calls for "a government of the people, by the people, for the people," as Abraham Lincoln famously stated in his Gettysburg Address on Nov. 18, 1863. You see, the United States uses an Electoral College system — instead of the popular vote — to decide who wins the Oval Office every four years. That's why one of the most common questions asked during an election is, "What is the Electoral College?" We're here to answer that question for you. The Electoral College is a group of people who ultimately elect the president and vice president. The college consists of 538 electors who are chosen to vote on behalf of their state. The number "538" may seem random, but it is designed to equal our number of congressional members (435 representatives, 100 senators, plus three more from the District of Columbia). These 538 electors meet on the first Monday after the second Wednesday in December to cast their votes for president and vice president. Here's the key: Electors are encouraged – but not required – to cast their votes based off of the popular vote in their state. How Are Electoral College Members Chosen? A state's political parties choose potential electors at their state's party conventions or by vote via the party's central committee, so it helps to have long-standing service and dedication to your party. As long as you do not fall into any of the above categories, you are technically eligible to become an elector. How Are the State Votes Allocated? 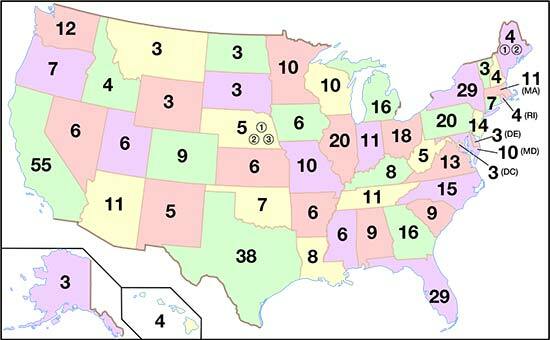 Each state receives two votes, or elector spots, automatically. Then, the states receive additional votes according to population count. Originally, this was a problem because the District of Columbia was not recognized as a state and therefore received zero Electoral College votes. In 1961, the 23rd Amendment was passed, which gave D.C. the automatic two votes, plus one more — the same as the least-populated state in America, Wyoming. Every 10 years, in a process called reappointment, the number of electors for each state is reallocated according to current population. Each state may gain or lose votes during this process. A swing state is a state where votes are fairly evenly split between the two parties. In one election cycle, they may vote Republican, and in the next, Democrat. Typically if a candidate fails to win over the majority of swing states, they'll lose the election. For instance, Florida has cast votes for the winning presidential candidate 75% of the time between 1900 and 2012. Every four years, the Electoral College is put back into the spotlight as being an outdated and corrupt system. In a 2013 survey conducted by Gallup, 63% of Americans would vote "for" doing away with the Electoral College. For example, mainly liberal states like California, New York, and Maryland would overpower votes from many other states because of population. In other words, the needs and wants of the people in less-populated states would be ignored during elections. To the same point, the Electoral College helps to draw attention from presidential candidates to each of the states. If the system were reversed back to solely the popular vote, states with low population rates would be less attractive to candidates. For example, Wyoming, a state with a population of less than 600,000, would be less likely to get any attention from a candidate compared to Pennsylvania, a state with over 12 million residents. Because the needs of the people in Wyoming deserve just as much consideration from the future POTUS as the needs of the people in Pennsylvania. Without the Electoral College system, votes from states that have low population rates (North and South Dakota, Alaska, etc.) would essentially be wiped out by states like California, New York, and Texas. The main problem with the Electoral College is that while electors are supposed to vote according to the outcome in their state, they are not required to do so. And in fact, since the founding of the Electoral College, individual electors have voted against the person the citizens voted for over 80 times. That's why the opposition to the Electoral College system note this as being the main reason why citizens do not vote at all: It's a system that promotes apathy — not what you want in a democracy that relies on election to achieve the best representatives for the people. The system allocates votes to each state, but doesn't account for the citizens who don't live in a recognized state. For example, the people in U.S. territories like Guam, Puerto Rico, and the Virgin Islands do not have electoral votes. That's 4.4 million people that are directly affected by the election but don't get a say in the outcome. And second, because of the way electoral votes are allocated among the states, some states receive more (or less) votes than they really should. Each state automatically receives two votes, regardless of population size. So a state like Rhode Island, which should only have two votes based on population, gets four votes. This causes a state like Ohio, which should have 20, to only have 18. Have friends and family also wondering "What is the Electoral College"? Please share our content with them on Twitter @moneymorning or Facebook. Is It Time to Throw Them All Out? Electors are required by state laws to cast their votes for their party's candidate. There have been 22,991 electoral votes cast since presidential elections became competitive (in 1796), and only 17 have been cast in a deviant way, for someone other than the candidate nominated by the elector's own political party (one clear faithless elector, 15 grand-standing votes, and one accidental vote). 1796 remains the only instance when the elector might have thought, at the time he voted, that his vote might affect the national outcome. America has never used the national popular vote, alone, to determine the presidency. The Electoral College has always elected the President. In 1789, in the nation's first election, a majority of the states appointed their presidential electors by appointment by the legislature or by the governor and his cabinet, the people had no vote for President in most states, and in them, only men who owned a substantial amount of property could vote, and three states used the state-by-state winner-take-all method to award electoral votes. California, New York, and Maryland would Not overpower votes from many other states because of population. Maryland is only an average sized population state. The 11 largest states, with a majority of the U.S. population and electoral votes, rarely agree on any political question. In terms of recent presidential elections, the 11 largest states have included five "red states (Texas, Florida, Ohio, North Carolina, and Georgia) and six "blue" states (California, New York, Illinois, Pennsylvania, Michigan, and New Jersey). The fact is that the big states are just about as closely divided as the rest of the country. For example, among the four largest states, the two largest Republican states (Texas and Florida) generated a total margin of 2.1 million votes for Bush, while the two largest Democratic states generated a total margin of 2.1 million votes for Kerry. Oklahoma (7 electoral votes) generated a margin of 455,000 "wasted" votes for Bush in 2004 — larger than the margin generated by the 9th and 10th largest states, namely New Jersey and North Carolina (each with 15 electoral votes). Utah (5 electoral votes) generated a margin of 385,000 "wasted" votes for Bush in 2004. Two-thirds (158 of 234) of the general-election campaign events up to the 3rd debate were in just 6 states (Florida, Pennsylvania, Ohio, North Carolina, Virginia, and Iowa). 92% of the events (214 of 234) were in the 11 closely divided "battleground states" identified by Politico and The Hill. Again, the system was NEVER solely the popular vote. With the current system, Wyoming, North and South Dakota, Alaska, etc., are among 24 of the smallest states, that are ignored, and get NO attention in presidential general elections. $0 is spent on TV ads. No visits. A survey of Wyoming voters showed 69% overall support for the idea that the President should be the candidate who receives the most popular votes in all 50 states. The RARE faithless electors that have never affected the national outcome are not the main reason why citizens do not vote at all. State laws that do not treat every voter, everywhere equally are. 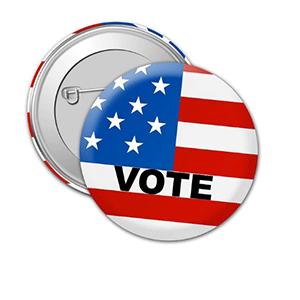 Presidential campaigns do not poll, organize, visit, and appeal to more than a handful of states. One would reasonably expect that voter turnout would rise in 80%+ of the country that is currently conceded months in advance by the minority parties in the states, taken for granted by the dominant party in the states, and ignored by all parties in presidential campaigns. In Gallup polls since 1944, only about 20% of the public has supported the current system of awarding all of a state's electoral votes to the presidential candidate who receives the most votes in each separate state (not mentioned in the U.S. Constitution, but later enacted by 48 states) (with about 70% opposed and about 10% undecided). Most Americans don't ultimately care whether their presidential candidate wins or loses in their state or district . . . they care whether he/she wins the White House. Voters want to know, that no matter where they live, even if they were on the losing side, their vote actually was equally counted and mattered to their candidate. Most Americans think it is wrong that the candidate with the most popular votes can lose. We don't allow this in any other election in our representative republic.